Home > Safety Signs > Mandatory Safety Signs > Manual Handling: Safety Signs & Warning Labels > Caution heavy load label. Caution heavy load use fork lift label. 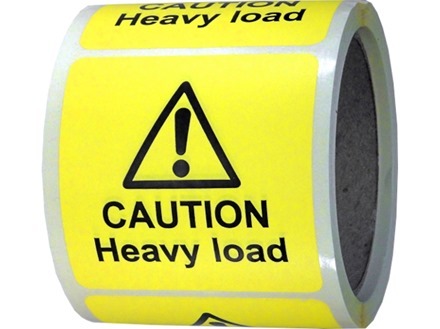 Caution heavy load use handling aids label. Caution two person handling required label. Lift correctly symbol and text safety sign. Manual handling regulations, what you should know pocket guide. Prevention of injury by correct manual handling safety sign. Seek assistance with heavy loads symbol and text safety sign. Caution heavy load label. Part of our manual handling warning safety label range, to clearly identify parcels and packages that are heavy to handle. Supplied in rolls of 250 labels. Manual handling warning signs, notices and labels. 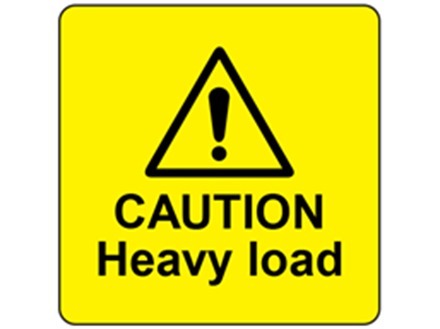 Caution heavy load label. Comply with Manual Handling Operations Regulations 1992, ISO 7010 and Signs and Signals Regulations 1996. Supplied in roll of 250 labels. MHL10000 Size 75mm x 75mm. Material self adhesive paper.